The boyfriend and I were walking to the car after dinner this past weekend and came across a lonely branch sticking out of a garbage can. 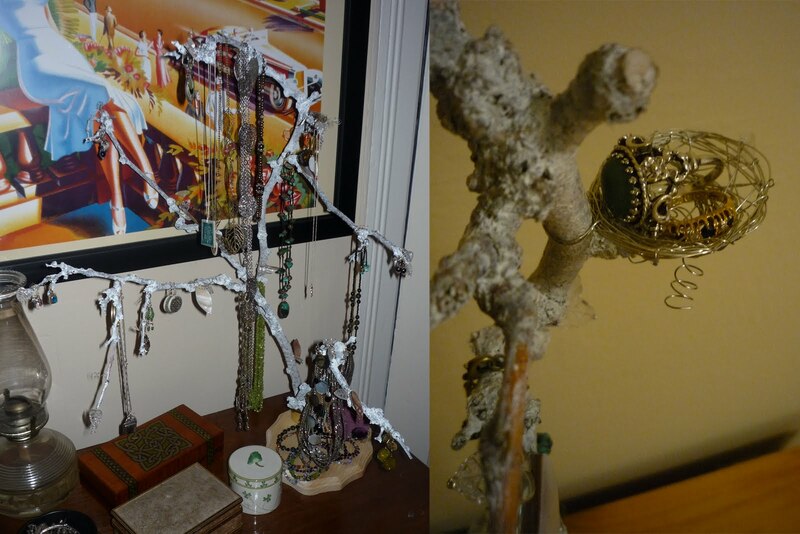 At once, my tree jewelry stand project flashed into my head. Those forked limbs! Those nubby little knobs! It's perfect for hanging necklaces! Into the car it went. I settled into project mode last night while watching my Season 3 Tudors DVDs and finished my stand in one sitting. One sitting! After sawing it to size, breaking off loose branches, and sanding down a few rough patches, I gave the branch a bit of a white wash (there's still white paint stuck under my cuticles; I'm incredibly fond of hitchhiking paint). Once the branch was dry, I drilled a hole into the wooden base and screwed it together, careful not to split the wood. I was scared that it would be off-balance, but I was in luck (thank you, Mother Nature) and went on to decorate the limbs with curls of silver wire and crystal and abalone leaf beads. My favorite detail has to be the bird nest, the perfect size for nestling rings. I'm so pleased with how it turned out. It could easily be the centerpiece to my table and not a jewelry stand at all! Voila! A tree jewelry stand, just like that. All my bobbles, which were previously organized in teacups, are beautifully displayed in their new home. It reminds me of Spanish moss hanging off trees in the bayou, that haunting image of tangled roots meeting water and a curtain of moss dripping through a cloud of fireflies. I love it.